The 10 Best Places for Fried Chicken in Rhode Island! You’ll be licking your fingers after trying the fried chicken at these fantastic Rhode Island restaurants. Find both fried chicken served up with new twists or coming in more traditional dinner meals. Either way, when it comes to fried chicken in Rhode Island, you can rest assured knowing it will be delicious! Here are the 10 best places to get fried chicken in the Ocean State. Open Tuesday through Sunday bring your own beer to this restaurant, which offers incredible chicken sandwiches made out of all dark meat. Try the Viet Now, which is topped with slaw, Sriracha, and fish sauce. Don’t forget the sides, which include biscuits, green salad, tater tots, or mac and cheese! This no frills fried chicken spot serves up some of the best chicken and wings in the state at a price anyone can get behind. 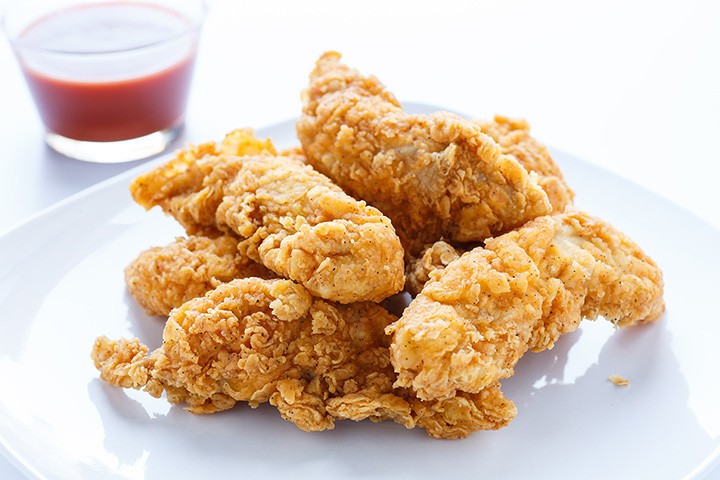 Pick up 15 pieces of fried chicken for just $17.99 or 35 pieces for $34.99. You’ll love the late-night hours as well. This late-night spot offers incredibly juicy and crispy chicken at an equally satisfying price. Their amazing chicken is complimented by great service and a clean environment. The options are seemingly limitless out at Royal Fried Chicken—there are even low-cost deserts on sale like the tres leches cake or 99-cent apple pie. Looking to feed a large family? Take home a royal bucket, which includes 21 pieces of chicken, eight servings of mashed potatoes, three orders of coleslaw and 12 rolls. Grab some rice and beans, mac and cheese or plantains for the side, too! Served on metal trays in a modern, simple setting, the chicken at Bucktown is delicious every time. Go for a $13 fried chicken dinner with waffle fries, collard greens or cucumber salad on the side. This isn’t your typical fried chicken place—Den Den Korean Fried Chicken serves wings and drums coated in delicious sauces like soy garlic, spicy sauce or white lemon cream. Paid that with Korean sweet potato fries or shrimp shumai for a meal bursting with flavor. This small-plats spot is a much more upscale take on Southern food that still packs plenty of flavor. You’ll want to try the hot fried chicken, which comes with potato salad, pickles, and white bread. Order one of their delicious cocktails while you’re there too! This traditional Southern food truck is an excellent bite for when you’re on the go. Their menu consists of organic, Southern-style fried chicken with sides such as collard greens, mac and cheese, red beans and rice, and hand-cut fries. Try their chicken sandwich, too. It’s to die for. Ogie’s, a trailer park-themed bar, is a great place to grab a beer and some fried chicken! Try the fried chicken sandwich—great comfort food with a juicy kick—to pair with your drink. Step inside Milk Money’s rustic-chic space, with wood reclaimed from the 1668 home of Rhode Island’s first governor, and you might not expect to have some of the most delicious fried chicken you’ve ever tried. But make sure to try the Togarashi fried chicken, which comes in an ample portion great for sharing!